December 23, 1952. A transcontinental train is stopped cold by an avalanche in a remote Colorado canyon. There’s a murderer aboard, one who has already killed, and will kill again unless stopped. The California Zephyr, with its run from Oakland to Chicago and back, was famous for 21 years for its Vista-Domes, providing a 360-degree view of the spectacular Western scenery. It is a veritable small city on tracks, populated by passengers from all walks of life and a large crew whose duty it is to keep them safe. Zephyrette Jill McLeod is the passengers’ primary point of contact. She’s armed for any emergency—with a first-aid kit, a screwdriver, and her knowledge of human nature. But can she figure out a clever plot and stop a ruthless killer? 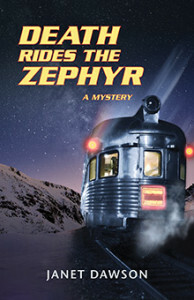 It’s April 1953, and Zephyrette Jill McLeod is back on the rails, aboard the fabled train called the California Zephyr. Heading west from Chicago to the San Francisco Bay Area, Jill looks forward to reuniting with family members and the new man in her life. She’s learned to expect and deal with just about anything on the train, from troublesome passengers to long-lost relatives to high-stakes poker games. But the stakes just got even higher: Death has a seat at the table. It’s almost midnight on the sleek streamliner known as the California Zephyr, en route from Oakland to Chicago in 1953. 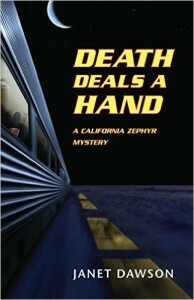 Heading for her quarters, Zephyrette Jill McLeod walks through the Silver Gorge Pullman car, and sees something she can’t explain. Is the shimmering light a ghost? Jill doubts the evidence of her own eyes, but soon learns that others have seen the phenomenon, too. 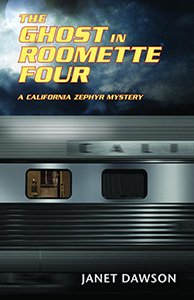 Whatever—whoever—is haunting roomette four may be connected to an incident two months earlier, when Jill found the body of a young man there. The verdict on the death was natural causes. Now it looks like the unquiet spirit is pointing to murder. Several years ago Janet Dawson took a trip on the Pacific Sands, a privately owned Pullman car. The owner told stories about a roomette on the car that was supposedly haunted. Passengers would tell about hearing voices during the night, and the porters who worked trips talked about the porter call button in the roomette ringing. When the porter answered the bell, no one was there. As a mystery writer, anything and everything was grist for the mill. As a matter of fact, the roomette on the Pacific Sands was number four.